Ever been stuck between a large tractor trailer truck on a single-lane highway? It’s the same unfortunate story for many a driver. The winding road and the size of the truck make passing the truck dangerous, yet the tedium of driving behind the truck drives a lot of people crazy; until now. 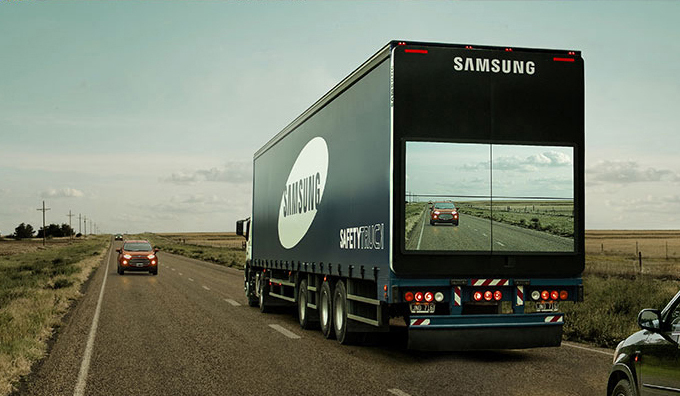 The new design from Samsung offers a great way to keep driver’s safer while attempting to pass or overtake these large vehicles. The technology includes a camera on the front of the truck and a 4-panel display on the back of the truck. The camera provides a picture of any vehicles in front while displaying the picture on the back of the truck. This gives the following car a clear picture of potential oncoming traffic allowing them to make a better choice of when to pass. This technology even works under cover of darkness as the trucks headlights provide an illuminated display at night. Of course with any technology that driver’s come to rely on may have to be vetted against the potential of lawsuits against trucking companies or Samsung for this valuable service. What happens when the camera lens becomes partially covered creating a blind spot and a driver makes a fatal passing mistake? Or with distracted driving laws in effect, would the display cause a distraction to rear drivers that do not pay attention to the road or the truck braking? These questions need to be answered before even legislators consider the potential of adding this unique technology to allowable on public roadways. With technology in driving become more prevalent in all transportation modes including heads-up displays, forward and rear collision warning systems, adaptive cruise controls and land departure warnings, it seems this new system of passing a truck should be a natural fit.